This is the concluding part of complete body workout for pregnant women comprising of Lower Body workout aiming to workout the pelvic floor, stomach, legs, hips and thighs. A warm-up and stretching needs to be an essential part of your workout regime. Remember, your body is more flexible during pregnancy due to the joints and ligaments loosening, and this makes you even more susceptible to injury. Stretches should be done in a slow manner – never overstretch, and no bouncing. 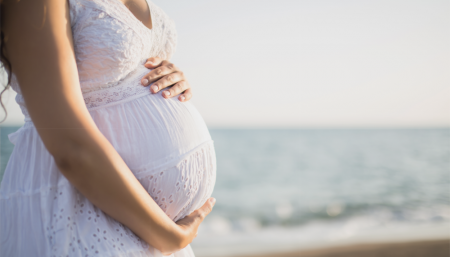 The stomach muscles bear most of the pressure of the body’s changes during pregnancy, and yet before pregnancy the muscles are rarely, if ever used. Watching your stomach expand during the 40 weeks of pregnancy will give you some idea how stretched your muscles become. It is essential you work the muscles to muscles become. It is essential you work the muscles to keep them elastic and strong. Strong well-conditioned muscles not only assist in the delivery of your baby, but help you regain a flat tummy soon after. The central abdominal muscles are those most susceptible to strain during pregnancy. Some women experience muscle separation which may be very slight, or up to 10 centimeters. It is important to check this separation, and if you have difficulty in locating the rectus abdominus ask your doctor or prenatal instructress. A simple way to check yourself is to lie flat on your back with knees bent. Now raise your head and shoulders slowly about 20 centimeters off the floor. Keep your chin tucked in. Have someone see how many fingers fit horizontally between your muscles. It they can fit more than three fingers, your muscles have separated to a point where you SHOULD NOT do any stomach exercises that involve rotating the body, twisting the hips or bending the body to one side, as these will aggravate the problem. You should only attempt corrective exercises, and leave the more strenuous exercises until the gap has closed. Some pregnant women, especially those over 30 weeks, experience a dizzy or faint feeling when lying on their back. The increased weight of the uterus and baby on the major vessels returning blood to the heart causes a fall in blood pressure. So, if you feel dizzy, only choose exercises that involve alternative positions during later pregnancy..
With your chin towards your chest, alternately criss-cross bent arms as you roll your back down to half way (or to the floor) and on the way up. Do not arch your back. Repeat 10 times. Note: The following exercises are not to be attempted if your muscles have separated. Sit with your back straight, knees bent and your hands just below your knees. Keep your feet about 30 centimeters apart. Gradually lean back, straightening your arms and putting your chin towards your chest. Tighten your stomach muscles and hold for 10 seconds. Slowly straighten your back, holding your head up and tighten your stomach muscles and hold this position for another 10 seconds. Repeat 10 times. Roll your back gently towards the floor as you sit with your knees bent and your feet about 30 centimeters apart. Bend your arms so your elbow reaches towards your opposite knee. Repeat 10 times. Lie on your back with knees bent and hands on thighs. Push the arch of your back to the floor and slowly raise your head and shoulders, reaching towards your knees. Make sure you do not curl up too far or you may strain your back or pinch your stomach. Repeat between 5 and 10 times. Sit with your legs crossed, back straight and your elbows tucked into your waist. Swinging your arms up and down gradually lean back as you lift your legs a few centimeters off the ground. If you are over 30 weeks, leave your legs crossed on the ground. Lean up and back working up to 10 repetitions. Practice working your pelvic floor each day with the following exercises. Start with your legs apart and feet that on the floor. Drop your arms gracefully in front of you. Gradually, with a straight back, bend your knees out over your feet, and then straighten them. Work to a count of 4-4 down and 4 up. Do not let your bottom stick out. Repeat 10 times. This exercise can be practiced in a variety of position e.g. sitting on a chair, or lying down. For this particular example – stand with your knees bent slightly, head tail and back straight. You are going to imagine you are in an elevator going from the first to the fourth floor of a building. Contract the pelvic muscles a little at a time, tightening them at each floor. Take them right up to the fourth floor, where you are as tight as you possibly can be, and hold for a count of 5. Then gradually release the muscles back to the ground floor. Repeat as often as you can every day. This exercise limbers the pelvic region and strengthens the thighs. Stand with legs about hip-distance apart and back straight. Gradually bend your knees and squat down with your feet parallel or turned out. Try to keep your feet flat on the floor arms on your knees and relax into the squat and hold for a few moments. Repeat often. Avoid this exercise if you have knee problem. Stand with your feet about hip distance apart and knees bent slightly. Keep your hands on your waist. Without arching your back or moving your upper body, push your pelvis slowly forward and upward. Repeat 10 times. Lie on your back with your knees bent. Your feet flat on the floor and about 30 centimeters apart. Press your lower back to the floor. Tighten and contract your abdominal and pelvic floor muscles. Hold for count of 5 Repeat 4 times. This exercise will strengthen the stomach and pelvic floor muscles and stretch the inner things. Sit with a straight back (not arched) and the soles of your feet together. Keep your knees wide apart. Rest your hands on your ankles. Tighten and flatten your abdominal muscles and round your lower back. Tighten your pelvic floor muscles at the same time. Gently relax all muscles as you use your back to lift your body. Repeat 6 times. Overweight hips, thick thighs and bulging calves are common figure problems, especially for women. They may be partly due to fluid retention, but more often, they are caused by lack or muscle use. Lie on your side, with your bottom leg bent at the knee for support. Point your top leg as you raise and lower it to just above your bottom leg. Repeat 10 times for each leg. This exercise is specially for flabby inner thighs. You may have difficult doing this one if you are over 30 weeks, as your tummy might be too big – if so, go on to the next one. Lie on your side and rest the weight on one elbow. Bend the upper leg and place the foot flat on the floor just in front of the tight of the straight leg. Hold onto the call for support. Raise and lower the straight leg. Making sure the foot is turned out. Repeat 10 times for each leg. Lie on your side and rest the weight on one elbow. Now bend your bottom leg at the knee for support. Gently straighten your top leg towards the ceiling as you reach for your foot. Then drop your leg back to your knee. Repeat 10 times for each leg. Kneel on fours with your hands shoulder-distance apart. Keep your back flat, do push your tummy towards the ground. Raise your knee to the side and drop it back down, Repeat 10 times for each leg. Knee on all fours with your hands shoulder-distance apart and keep you back flat. Slowly bring one leg towards your tummy. Then extend a straight leg behind you. It is important not to raise your leg above shoulder height. You must NOT arch your back. Repeat up to 15 times for each leg. Kneel on all fours with your hands shoulder-distance apart and keep your back flat. Slowly bring your left leg towards your shoulder. Then extend a straight leg behind you again, as in the last two exercises: do not lift your leg above shoulder height. Repeat up to 10 times for each leg. On all fours, with your hands shoulder-distance apart and a flat back, lift your left knee to the side and straighten the leg. Then bend it and return it to the starting position. Repeat 10 times with each leg. The buttocks, just like all other parts of the body, need hard work to be tight and firm. Your buttocks should not grow during pregnancy as your tummy and breasts grow. Your bottom should remain firm and toned, but it will only remain in this state if you exercise it regularly. The following exercises will tighten and lift those cheeks. Lie on your back, with bent knees, feet apart and flat on the floor, with arms at sides. Lift your hips up, while keeping the back straight. Holding that position, squeeze the knees together and press apart again. Repeat up to 10 times. Lie flat on your back with your feet flat on the floor and knees apart. Place your arms beside you. Now lift and lower your button off the floor, squeezing your muscles as your lift. Repeat up to 15 tines. During pregnancy and after the birth of your baby, you are more prone to back problems. Your muscles have weakened and your ligaments softened. So it is vital you have good posture and take care of your back to help prevent back pain and excessive tiredness. Kneel on all fours, with your hands shoulder-distance apart and your back flat. Slowly exhale and push waist up into a ‘cat arch’. Pull buttocks and head under. Inhale and return 10 starting position. Repeat 8 times and work up to 20 repetitions, if you have been prone to lower back pain during pregnancy. Otherwise repeat up to 25 times each day. Lie on your back, legs straight and arms alongside you, relaxed. Bend your legs and bring them over your chest. Now, gently rock your legs straight down towards the floor. You must not lift your lower back off the floor. Lie on your back with your knees bent towards your tummy, and arms relaxed beside you. Twist to the right from your waist and lower your bent legs to the floor. Make sure you leave both shoulders flat on the floor. Keeping your legs bent and together, twist them across your body. Repeat up to 12 times. Lie on the floor with your knees bent, feel flat on the floor about hip-distance apart, and arms relaxed beside you. Push the arch of your back towards the floor, then very slowly peel your back off the floor, one vertebra at a time. Your lower back, waist, middle back and finally shoulders. Make sure you do not arch your back. Slowly roll your spine back to the floor. Repeat 4 times. Before getting up, just take a minute or two to slowly stretch and relax.